Customers who do not pay their obligations on time cause businesses to lose money. By hiring an Arizona collections attorney, creditors can protect their rights and their businesses, while debtors can negotiate fair settlements and make sure the creditor is not breaking the law in the process of collecting from the debtor. The most important factor for a business owner is to choose an attorney who will help you get the most money possible quickly so that you are not bogged down by legal fees and can focus on running your business rather than collecting debts. Negotiation is very important when doing collections work, because there are many loopholes that can be used to protect or access funds in order to pay off or avoid paying off the debts. A good attorney can make all the difference. 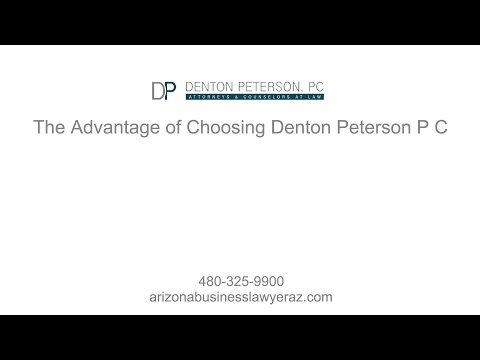 The collections attorneys at Denton Peterson, P.C. have experience in collection matters with and without litigation for both creditors and debtors, so we can effectively anticipate and counter the moves of the other side. We limit our clients’ costs by providing efficient and effective resolutions to problems. Debt collectors have several tools they can use to recoup what is owed them, including negotiation, out-of-court and court-involved collection, garnishment of wages or non-earnings, sheriff’s sales, and other forms of judgment enforcement. Collections laws are a combination of both Federal and State law, so every state will have different laws that favor some collection strategies over others. Collection in Arizona, while similar to other states, can be quite unique when it involves married debtors because of Arizona’s community property laws, particularly if the debtors have relocated to Arizona from another state after incurring a debt or receiving a judgment against them. Our attorneys can guide creditor clients through the process of finding and accessing sources to recoup their money. We also can help protect the rights that our debtor clients are given by law, and in some instances stop, prevent or negotiate out of garnishment and other collection proceedings. People who have defaulted on payments to their creditors are often very difficult to contact. They often ignore phone calls, letters, emails, and other forms of communication hoping that creditors will give up on collecting money. Every minute business owners or their employees spend trying to reach people through phone calls and letters, takes them away from their jobs and running the business effectively. It can be very costly and frustrating. By hiring an attorney to help you, you can get back to running your business. When we assume the duty to make people aware of their financial obligations, they realize how serious you are about getting your money back. This provides leverage in negotiations and creates incentives for them to start working with you rather than avoiding you. The most cost-effective and timely way to collect debts is often to negotiate a settlement in order to avoid the costs and wasted time of litigation. Customers who are unable to pay their debts in full may be able to create and abide by a payment agreement. The collection lawyer can set up this arrangement for creditors and make sure that the debtors follow the agreement by paying their bills on time. This way, our clients can make up their financial losses without worrying about keeping track of the payments and trying to enforce the agreement. The key to negotiation is leverage. Effective debt negotiation is not simply asking for more or less money. It involves complex factors about the laws that apply to a given situation and how they help or hurt you, possible legal defenses, current debt/income of the debtor, and possible mistakes or other conduct by either party throughout the process that a judge will take into account. A good lawyer will help see the leverage you have and negotiate the best deal possible given your individual circumstances. Sometimes customers just do not keep their end of the bargain, and business owners are forced to use legal methods to recover their money. A few options available to business owners are to sue the customer in court and obtain a judgment; to garnish their wages and bank accounts; and/or to execute on and sell the debtor’s property through a sheriff’s sale. The goal is for our creditor clients to earn back the money they have lost throughout the legal proceedings. It is very important that the correct procedures be followed, because the court may issue an order for monetary penalties against either party if they do not proceed properly through the collection process. The Fair Debt Collection Practices Act can loom large if creditors use illegal methods to pursue debts. One of the most common methods used in debt collection in Arizona is to garnish a debtor’s wages. A garnishment order functions as a continuing lien on the debtor’s earnings. First, a judgment must be obtained against the person who owes money. Once a judgment is obtained and a garnishment entered, the employer of the person who owes money will be required by law to deduct a certain portion, often 25% in Arizona, of the employee’s wages from every paycheck and send that money to the creditor. Garnishing wages becomes increasingly complicated and a less effective method if wage garnishments have already been entered for child support and/or alimony payments. Arizona’s garnishment laws also allow for the garnishment of funds in a bank account, stocks, bonds, and other personal property in order to pay off a judgment. When working with a debtor or a creditor, we work to ensure that the creditor follows the correct procedures to maximize our client’s interests. Many times states put limits on how much can be taken from an account, or how much must remain in the account. When the accounts are joint accounts, there are additional laws that can protect the other people who share the account. It is important to have a lawyer who knows how to find accounts that may be hidden in different banks or within the same bank. The law also allows for access to safe deposit boxes in certain situations where the law rules that it is appropriate. Glad I was referred to them! Sheriff’s sales are another avenue that creditors can use to get their money in Arizona. A sheriff’s sale is a public auction of property that has been executed on to satisfy a judgment of unpaid obligations. Sheriff’s sales are used when there is no other way for a debtor to pay his debts than to sell his property. The Uniform Enforcement of Foreign Judgments Act establishes the procedures necessary to get foreign judgments recognized in Arizona. If you have a judgment from another state, it can be collected in Arizona, but the correct procedures must be followed. In order to do this, a creditor must file an authenticated copy of the judgment (a certified copy will not be enough) with the Superior Court in Arizona and then pay the appropriate filing fees. Additionally, an affidavit with the name and address of the creditor and debtor must be filed. Once filed, notice must be mailed of the filing of the judgment and a copy of the judgment to the debtor. The court must be notified of the mailing. The filed foreign judgment can then be treated as if it were a judgment from the Superior Court, although the creditor must wait twenty days before beginning to enforce the judgment. In some cases, the statutes of limitations may differ from other states, and may render out-of-state judgments unenforceable. You will want to discuss the specifics with a knowledgeable lawyer. Whether you are a creditor or debtor, the Phoenix attorneys at Denton Peterson can help make sure you find the best solution possible for your debt collection situation. We will take the time to thoroughly examine all possible avenues for relief and choose those that will be most effective for favorable judgments and avoiding excessive costs or time. Contact us today for help with any collections issues.